When you use OneDrive, you'll never be without the documents, notes, photos, and videos that matter to you. 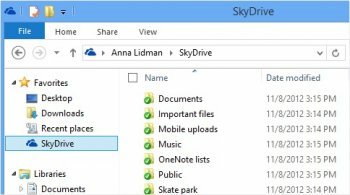 Store anything on your SkyDrive and it's automatically available from your trusted devices - no syncing or cables needed. I used to trust MS but since the advent of spying on Win 7 users & the absolute removal of any privacy on Windows 10 I don't anymore - Most of the times my docs are safe on multiple external drives/ network- OneDrive has its uses but keeping confidential documents or files is no longer one of them. It is a very practical utility but why have this ridiculous looooooooong version number. I really despise programs with looooong version numbers. In my opinion 17.3 or 17.4 is quite sufficient and adequate. I like it short and simple. Ya good luck with all that. SKydrive is a must for me. I get the space i need and can access my files from any of my computers. Cloud storage that works and is free. I use it to also sync my onenote files and would be lost without it. I can access my onenote files on my laptop, ipad and my phone. You know what microsoft, by not even showing linux on your list of desktop operating systems, it makes you look even more like effing c#nts. @nvic: The fact that you use a stone age operating system and whine about new products not supporting is says a lot about you. No company would be sad to see such customer go elsewhere anyways. Personally I like the way SkyDrive works in general and the tight integration with Windows 8, Windows Phone and Office 2013 is just fantastic. This Windows client is good but can become even better. Stopped using skydrive when the client stopped supporting XP. Moved everything to dropbox and have no complaints. Works on older systems unlike this junk. The more stuff that MS drops XP support for, the less MS stuff I use. I don't have the option of upgrading to Win7 on several of my systems. Files in skydrive are NOT deleted if they are deleted from the computer. That is false. If you should accidentally drop your computer into the maw of a volcano your files will still be accessible in skydrive. The 25 gigs of free storage is a big draw as well, unfortunately they're only available to those of us born before 2012. The ONLY thing this app gives that is any benefit is the ability to upload much larger files. But otherwise its extremely basic with no features. Its also dangerous to use due to the very fact that if you accidentally delete a file on your computer, it will also get deleted off of Skydrive, making your "backup" totally worthless. That is just incredibly stupid. Your probably better off just using the browser to upload files to skydrive, even with the lame file size limit restriction. Really good. Ditching support for dated OS's seems to have paid off and made the product really good. No xp support, what a joke. Remek felh? tárhely,ingyen 25.-Giga !